For years we’ve kept our large format printing production schedule on a shared Excel 2007 spreadsheet. Everyone has access to the file, which we kept on the server. In the last few months, we’ve had a continual problem with the spreadsheet changing to a non-shared version all by itself, and it drove us nuts. Everyone would have to close it, we would change the sharing, and everyone would get back in. There’s lots of talk on the internet about this kind of problem, but no solution that has worked for us. And, it’s not like we have this huge IT setup, we are a company of 17 people. So we tried doing the shared spreadsheet in Google Docs, figuring that since everyone was accessing via the internet, Google would have the sharing thing figured out. It sure looks like they do! It took me about an hour to get everyone set up with a Google account and a shortcut on their desktop. 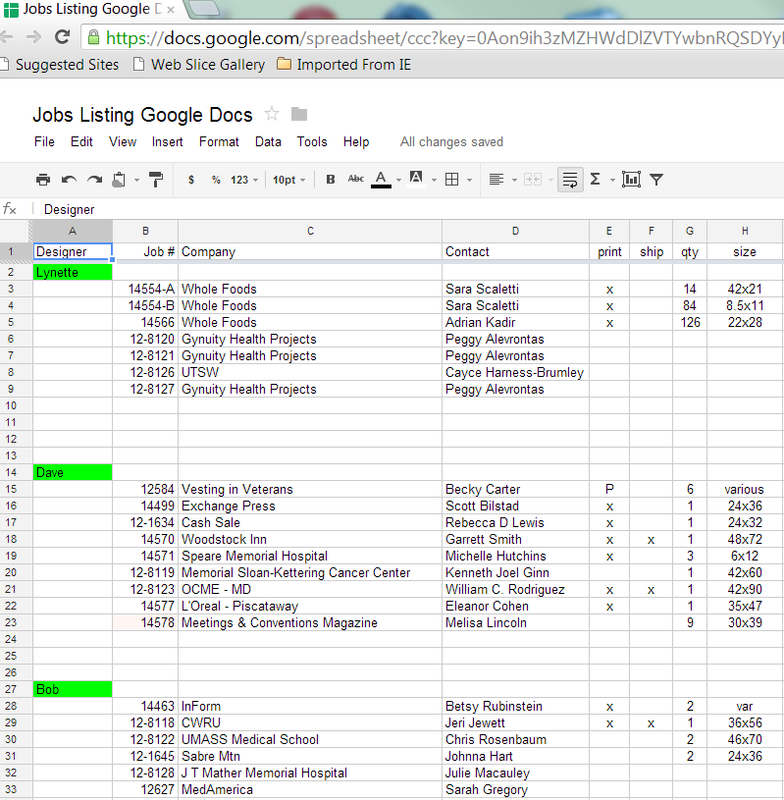 Google says that up to 50 people can share the spreadsheet at the same time. We are doing it with a dozen people, and we are very pleased with it. In fact, we find it easier to do things like add lines in Google Docs, which given the nature of what we do with the spreadsheet, we do quite a bit. Sorry Microsoft, but when the new Office comes, out, we are not going to buy it. Our original plan was to hope that the new Office would solve out problem, but this works well, and is available now. Best of all, it’s free. This entry was posted in large format printing and tagged Google Docs, sharing spreadsheets. Bookmark the permalink.